Children are the future of our society. No mother would let her children hungry, cold, quit education or work at too young age if she could prevent it. Behind the bright smiles of our children are always parents who give them love, care, safety and protection. In a lot of cases single mothers have to provide for their children all by themselves. They have to make double effort to give their children a safe and happy home. In Asia a lot of single mothers struggle every day and night to provide for their children. In Sharing International we help the worst-off single mothers in Asia help themselves and their families by giving them education and the chance of a steady income. A stable job with a steady income for the single mothers is the best way to guarantee a beautiful childhood, a better education and a brighter future for the children of Asia. We would appreciate very much to receive your generous donation or your loyalty membership. Your financial support will be used effectively to help single mothers and their children to a better life and a brighter future. Click here to learn more. We are organizing Asian Culture Festival in order to promote the integration of immigrants/refugees in Denmark and to raise fund for our projects in Asia. Detail program will be continually updated here. In the partnership with Sharing International, KOTO will do training for disadvantaged youths whose mothers are single mothers. Sharing International will pay for the training costs and further expenses. It costs USD 288/month for a trainee including training and living costs and expenses, healthcare, etc.. After graduation, KOTO and Sharing International will help these trainees searching for jobs locally and internationally. With this partnership, we provide street and disadvantaged youths a concrete career opportunity and a brighter future. You can donate for this specific project here. In the partnership with Sharing International, Mekong Quilts will do training for single mothers in Vietnam and Cambodia, employ them permanently and ensure to give them a fair wage and a good working environment. Sharing International will pay for their training, machinery cost and import all of the products from these single mothers to sell abroad. With this partnership, we help to create stable jobs and incomes for single mothers in Vietnam and Cambodia and to secure the education and good life for their children. You can donate for this specific project here. You can help to change this world to a better place by becoming a volunteer. There are various interesting activities in which you can participate. Give a sharing and loving hand to the worst-off single mothers – click here to learn more. All children have the right to read fairy tales and build up their own beautiful dreams. We are calling for book donations for poor Vietnamese children. 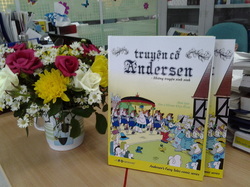 ''The tales of Hans Christian Andersen'' is illustrated by the famous Danish artist Werner Wejp-Olsen and consists of nine fairy tales, 135 colour pages and is printed in Vietnamese.